As thousands of firefighters and first responders continue to battle blazes throughout California, residents in contained areas are starting to get a firsthand look at the destruction that besieged their communities. In the northern California town of Santa Rosa, evacuated families were given the all-clear to return home on Wednesday. Despite its close proximity to the deadly flames, Santa Rosa is largely intact thanks to the heroic work of California state prison inmates, who have been working overtime to contain the spread of fire and preserve property these last few weeks. 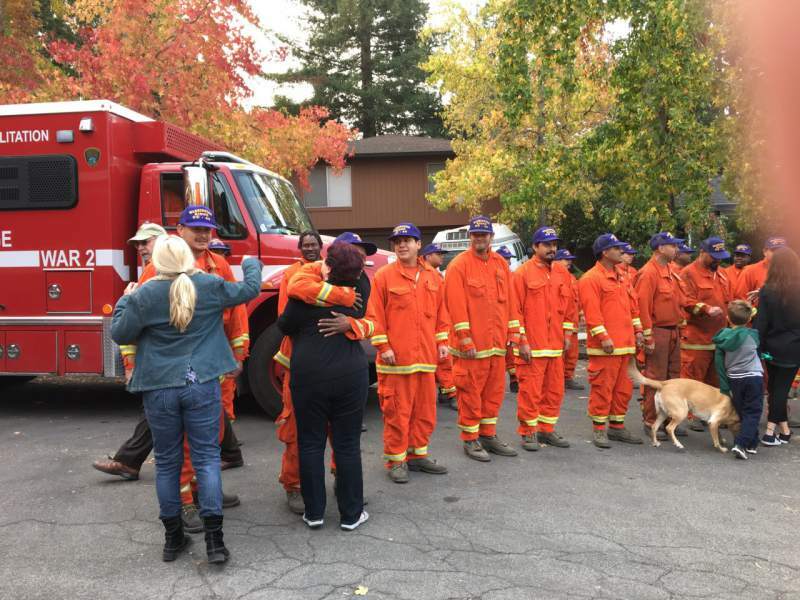 As the Press Democrat reported, orange-clad inmate-firefighters from the Washington Ridge Conservation Camp just east of Nevada City returned to Santa Rosa to welcome back those whose homes they had helped save the week prior. The team stood shoulder-to-shoulder as neighbors emotionally stopped to thank them for their service and share a hug. Sessa said some 1,700 inmates are currently battling 15 of the wildfires ravaging California. While a typical work schedule is 24 hours on-duty followed by 24 hours off, the prolonged nature of these fires has meant some crews are working up to 72 hours straight. The role of the inmate-firefighter is nothing new, though those assigned to the job have been working long, grueling hours to deal with this latest crop of blazes. According to CNN, low-security risk inmates can apply for positions at one of the 43 adult conservation camps, or fire camps jointly operated throughout the state by the California Department of Forestry and Fire Protection (Cal Fire), the Los Angeles County Fire Department and the state Department of Corrections and Rehabilitation. Selected inmates are tasked with maintaining hiking trails, clearing flood channels and reducing fire danger by cutting brush or large stands of trees—even when there are no fires ongoing. Despite the exhausting work conditions, conservation crews are considered a plum assignment because of the pay, food and freedom involved. As KALW radio reported, inmates get paid a standard $2 a day, plus an additional $1 an hour while working the fire lines alongside and under the leadership of Cal Fire personnel. Meals at the camps are also larger and more nutritious than typical prison fare due to the physicality of the work involved. In addition to being an integral part of the state’s emergency response and long-term efforts to fight wildfires, there is a rehabilitative component to the conservation camp program. Every inmate we have right now is either on a fire line, on a rest period from being on a fire line or providing backup to fire protection somewhere and ready to go to a fire. Inmate Michael Draebom agrees, sharing with KALW that while the work is “hard” and “beats you up,” there is also camaraderie and sense of purpose that makes it all worthwhile. Interested in more uplifting content? Check out this related video! Two middle school students responded to the California wildfires in the sweetest way. 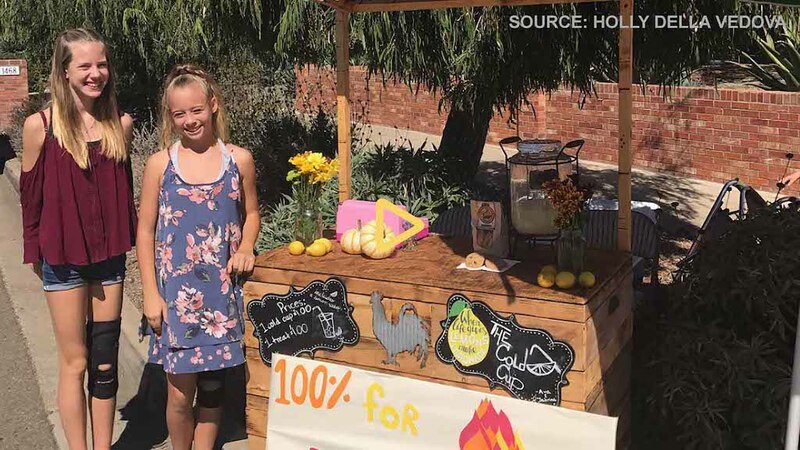 Through their lemonade stand, they’ve raised $400 to help victims and they’re just getting started!